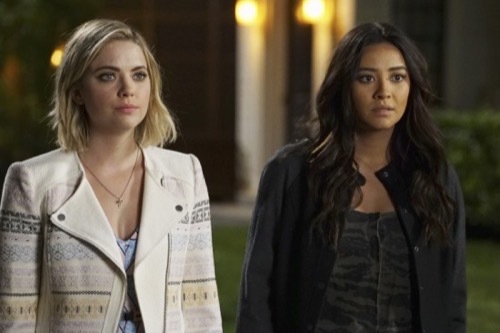 Pretty Little Liars returns to ABC Family tonight with an all new Tuesday June 16, season 6 Episode 3 called “Songs of Experience,” and we have your recap below. On tonight’s episode, Spencer [Troian Bellisario] investigates Charles and Aria [Lucy Hale] seeks info about Andrew. Meanwhile, Emily [Shay Mitchell] and Alison [Sasha Pieterse] each acquire a new friend; and Hanna [Ashley Benson] wants her old pals to reunite and put the events of the Dollhouse behind them. On the last episode, the girls may have gotten out of the Dollhouse but what happened to them during their time of captivity had lasting effects. With worried loved ones watching over them, the PLLs were home and trying to heal, with not much success. Even with suspected tormentor Andrew in custody, Aria, Emily, Hanna and Spencer fear they were far from safe. Did you watch the last episode? If you missed it, we have a full and detailed recap right here for you. The finale episode of season six’s PRETTY LITTLE LIARS is going to be really exciting and we’ll be recapping it for you right here. Tonight’s episode of Pretty Little Liars kicks off with Spencer on the phone with Emily – Emily reveals that Sara Harvey is at her house, and Sara says that there is no way that Andrew Campbell was Charles. Spencer isn’t buying it. Emily points out that Sara was in captivity for over two years, and Andrew was in school with them the whole time – there is no way that he could have snuck off to feed his hostage. Aria calls Hanna and tells her the news, Aria is still convinced that Andrew is the one who kidnapped them and held them hostage. The girls all agree on the phone to head back to school for the first time since they were kidnapped. Emily is getting ready for school and Sara is getting dressed. Emily says that when she is at school her mom will drive Sara home. Sara asks if she can hang out in her room for the day, she wants to talk to her when she gets out of school. Emily agrees and leaves a spare cell phone with Sara in case she wants to call her. Emily feels guilty because Sara is obviously shaken up, she decides not to go to school and to stay home with Sara. Aria stops at the coffee shop for breakfast before school Ezra can’t believe that she is going back to school already. He wants her to stay at the shop and relax, he jokes that she can alphabetize the spice shelf and reassures her that she will be safe at the shop. Spencer stops by Ali’s house – she tells Alison that she needs to talk to her dad again. Alison argues that her father has no idea who Charles DiLaurentis is. Spencer doesn’t believe him, and she knows that Alison doesn’t believe her dad either. Spencer leaves, before she goes she tells Alison that she is going to talk to Jason – he will tell her the truth. Hanna shows up to school, and realizes that none of her friends bothered to show up. She runs in to Dr. Sullivan, she thinks that Hanna should talk to her about what happened. Hanna sits down with Dr. Sullivan and describes when they were held hostage. Hanna talks about the sick games Charles made them play – she says that she thinks that Charles hated them because they were all friends, and he was trying to ruin their friendships. At the café Ezra finds Aria looking at old pictures of Andrew on her laptop. Aria explains to Ezra that she just wants to know who Andrew really is, and why he hated them so much. Ezra calls the jail and pretends to be Andrew’s doctor, trying to get information about him. They explain to Ezra that Andrew’s info is all sealed, with the rest of his adoption records. Alison runs in to Lorenzo, he is coaching a soccer youth group for boys for the church. Lorenzo invites her to be the youth group leader for the girls, Alison declines, but he won’t take “no” for an answer. Toby watches Lorenzo and Alison from across the street. Afterwards Toby pays Spencer a visit and begs her to talk to Alison, he doesn’t want her to sink her claws in to Lorenzo. Aria shows up at Emily’s house in a huff – she tells Emily and Hanna that she got it confirmed, Andrew is adopted which means he really could be Charles DiLaurentis. Hanna convinces the other girls to go to a group session at Dr. Sullivan’s office. Emily, Hanna, and Aria sit at the office waiting for Spencer to show up. Spencer storms in to the office and tells them that she knows who Charlie is – Jason thought he was his imaginary friend, but one day Mr DiLaurentis told Jason that Charlie had to go away. They put two and two together and realize that there was nothing imaginary about Charlie – Jason’s dad lied to him, he was actually his brother. While the girls are standing in Sullivan’s office Emily receives a video on her phone. “A” is in her bedroom where Sara Harvey is sleeping. “A” shows the camera a knife and tells the girls that if they don’t leave Dr. Sullivan’s office in 30 seconds Sara will die. Emily and the other girls race to her house to check on Sara, she is fine, she was in the shower. Emily’s mom returns home and has bad news for the liars – she says that the police are releasing Andrew Campbell because they have no case against him, he has alibis for when Sara Harvey was kidnapped and when Mona was kidnapped. Spencer and the rest of the girls pay Alison a visit, they tell her that her dad lied to her, and whoever Charlie was he sent him away when he was a little boy. Alison is upset, she remembers that Jason always thought something was missing from the family. They decide to look through the house and try to find proof that Charlie existed. Alison begins checking all of her parents’ hiding spots, while they are searching Spencer asks her about Lorenzo. It’s obvious that Alison actually likes Lorenzo, Spencer tells her that she got a second chance at life and she shouldn’t waste it. Aria is upstairs searching the DiLaurentis house, she dumps out jars full of buttons in the sewing room and finds a folded up picture of two little boys – one of them is Jason, and one of them must be Charlie. Alison is obviously shaken up, she tells the girls that they should leave and promises to talk to them after she talks to her dad about it. The liars leave and walk home in the dark, they walk past the police station and see Andrew Campbell leaving. Aria tries to talk to him, he shouts at her to leave him alone. He is furious, he tells Aria that the whole time she was locked away he was searching the woods trying to find her. Andrew sneers that he can’t wait to graduate and get as far away from them as possible, he compares them to a toxic dump before he storms off. Aria feels horrible, Spencer reassures her that Andrew will forgive them eventually.